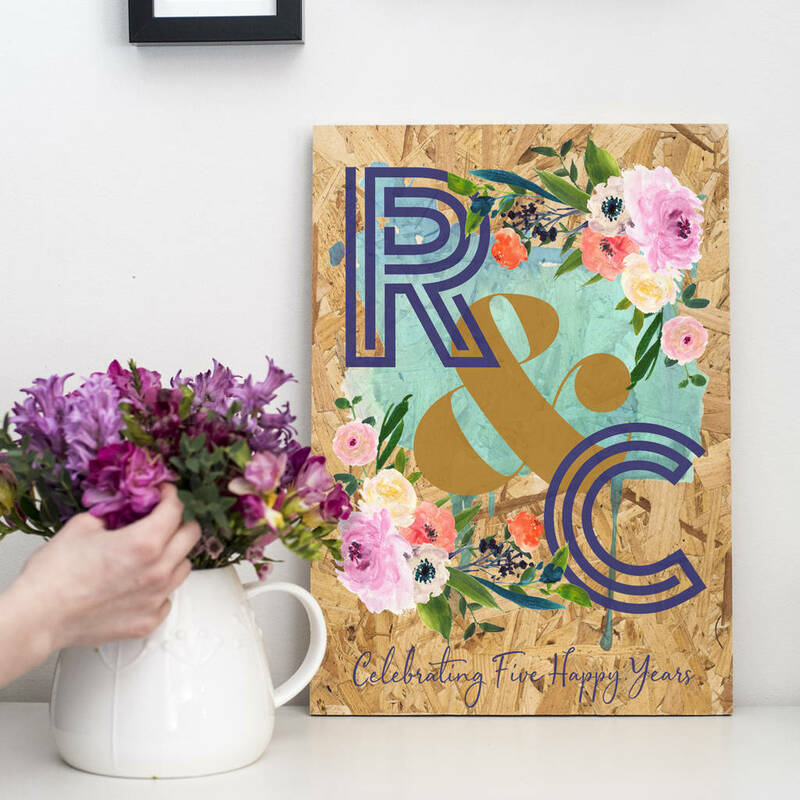 A rich and colourful wood anniversary floral initials print on industrial OSB board. Creates a stunning 5th - wood anniversary gift. 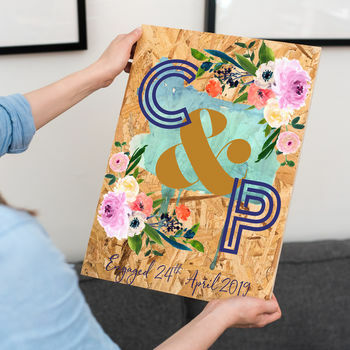 The striking mix of rich navy initials, gold coloured ampersand and watercolour style florals make this innovative print on wood an inspired addition to any home. Perfect as a 5th - wood anniversary gift, or to mark any milestone event in a couples life. This quality print would work well as a new home gift, engagement or wedding gift for a special couple. 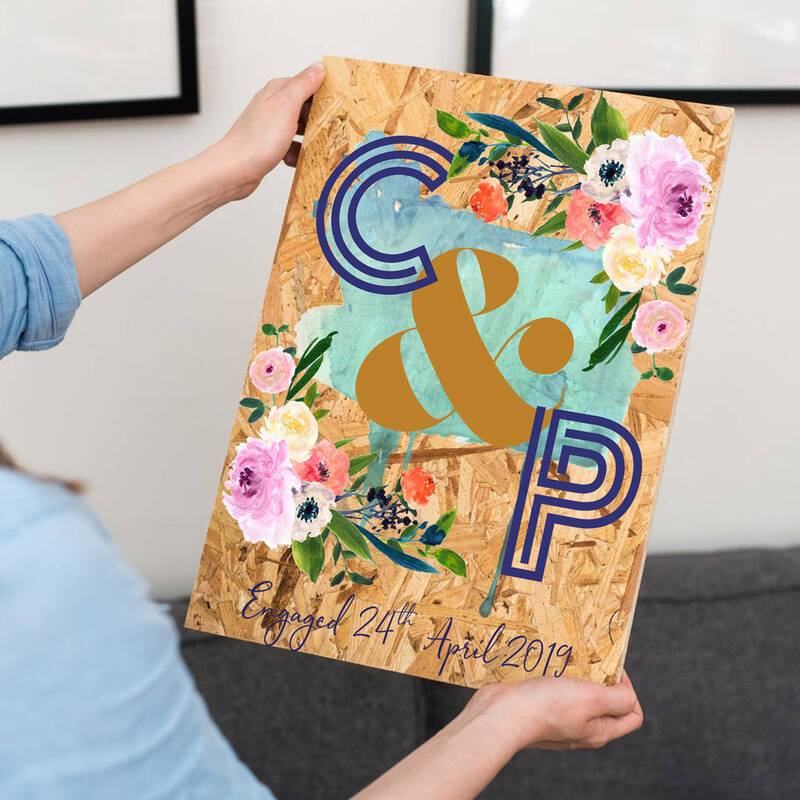 The chunky industrial OSB board creates a striking contrast to the colourful floral design that we print directly onto the surface of the wood. Designed to be propped on a shelf. 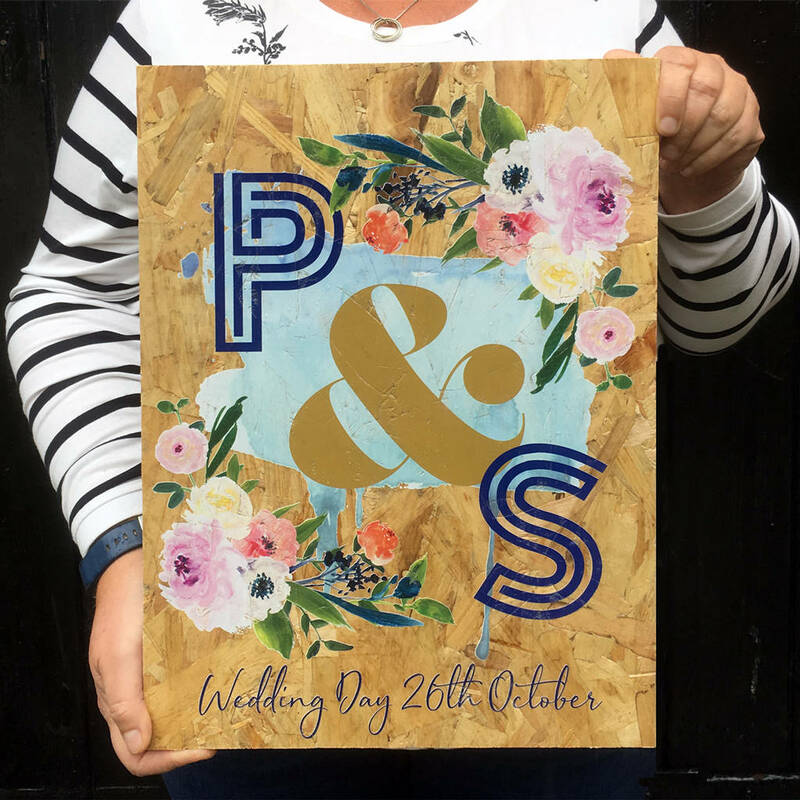 Personalise this wooden print with a couples initials and your own message beneath. 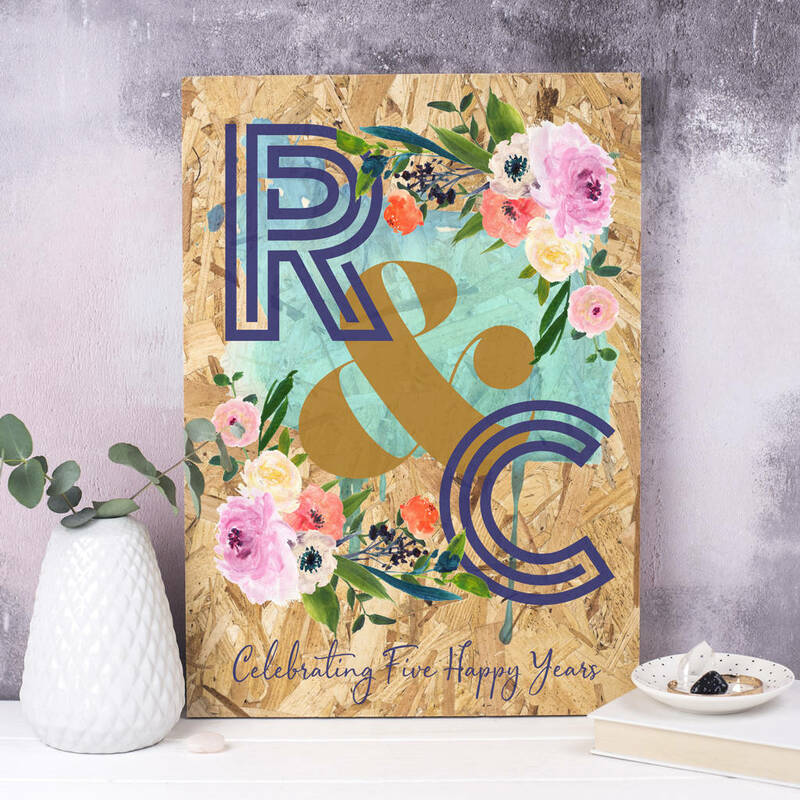 Our example reads 'Celebrating Five Happy Years', but this striking print works equally well for an engagement, new home or any milestone event for a couple. Because oF the textured wood finish we recommend a limit of 35 characters here to be clearly legible. The pattern and grain of the wood shows through the print to creating a textured finish to the print. Our OSB boards are supplied and cut for us by a local company and we print our floral initials design in our Derbyshire workshop and studio. 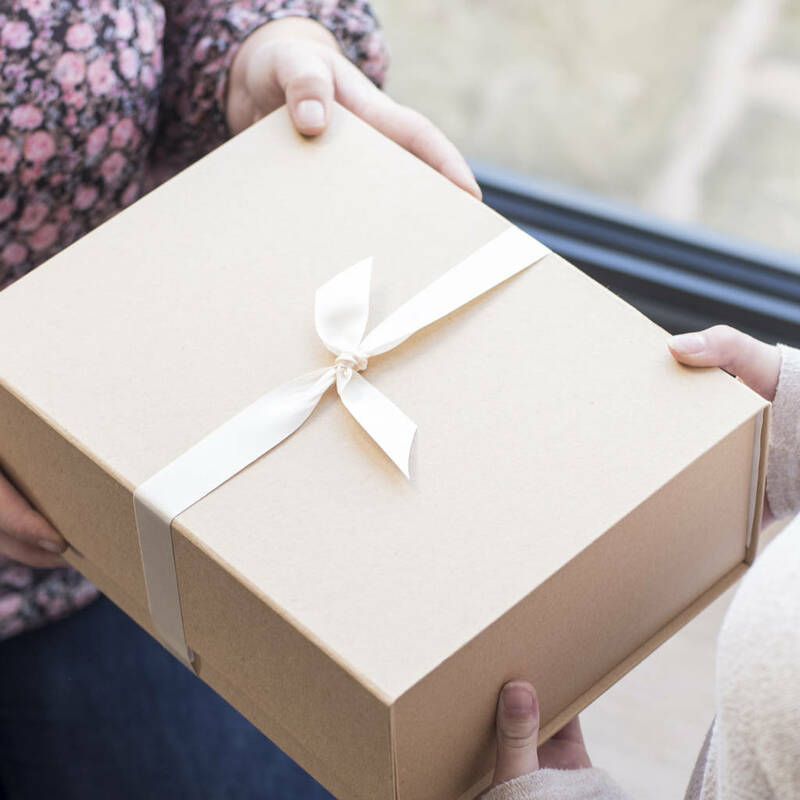 At Delightful Living we design and make a wide range of thoughtful personalised gifts for special occasions. Please take a look at our complete range by clicking on our name beneath the product image. We use construction grade OSB to create an industrial feel to this floral print. Some boards may have the wood manufacturers stamp on the reverse.